FFS Tech Conference only has sessions entitled “FFS …” which consist of 10-15 minutes of ranting followed by 15-20 minutes of audience participation discussion. Good rants argue for something, they are not just attacks against something. We address controversial topics in a robust yet constructive manner, which hopefully will lead to greater understanding amongst the audience and new ideas on how to address the issues raised. The first one was held at CodeNode in the City of London on Wednesday, 19th September, 2018. As part of our efforts to run FFS Tech Conference transparently we committed to publishing our conference accounts as evidence that it is a not-for-profit exercise. The final account for the conference are shown below. 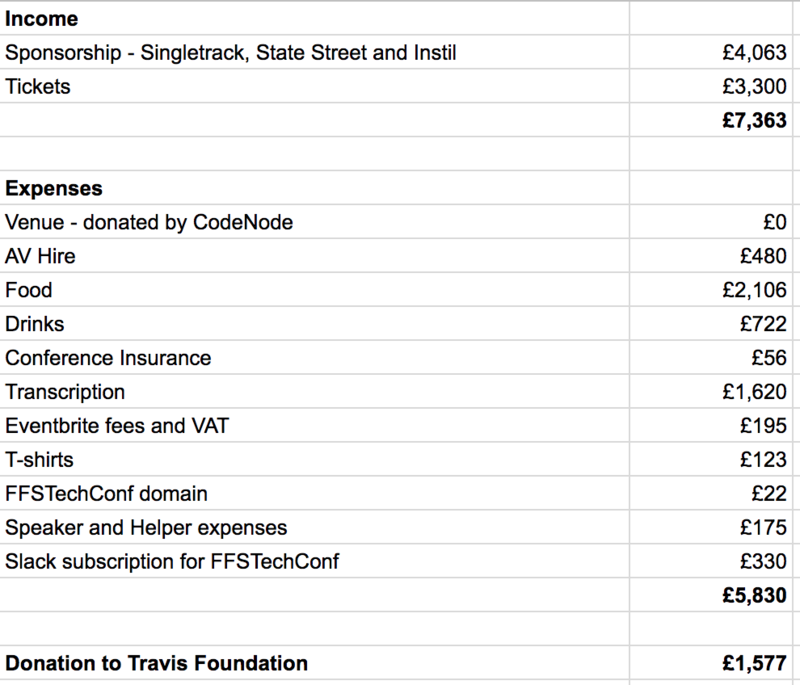 We decided that, as the key theme of the conference was inclusivity and diversity: of people and ideas, we think it’s appropriate to send the surplus amount to the Travis Foundation (aka diversity tickets) to help the work that they do to facilitate diversity in tech. Thanks again to our sponsors and to the attendees and their entrance fees for making this conference possible and enabling us to support the Travis Foundation and their good work. The first FFSTechConf are becoming available and will be added to the Programme page. The first FFSTechConf has been accomplished ! A huge thank you from the organisers to all the presenters, attendees, helpers, event staff, captioner and sponsors - through our combined efforts the event was successful and we’ve had a tremendous amount of very positive feedback. Well, we’re editing up the transcripts as promised (ensuring they stick within our rules of ranting) and will be publishing as they become ready over the next few weeks. We’re also compiling our accounts and will publish them, as well as declare the profit and to which charity it will be donated. We’ve been asked about the next one, and where FFSTechConf and the stuff we’ve learnt goes from here. We need to reflect and figure that out. Keep an eye on @FFSTechConf for news on this front. We are completely sold out, all the diversity tickets are assigned, and we have volunteer helpers. Food and drink ordered, venue sorted, AV arranged, transcription services ready to rock. Nothing left to do now except turn up on the 19th! We are amazed, thrilled and proud to announce that tickets are now completely sold out. There is a wait list in case there are any returns and we’re looking at options to open up some more spaces. There are still diversity tickets remaining. We are delighted to announce we have the use of the brilliant CodeNode facility in the City of London for Wednesday, 19th September, 2018. We will be there for the whole day, and probably will continue into the evening a little bit, too. More to come soon on tickets, programme, more precise timings, etc. We’ve published our initial draft of what we consider A Good Rant. These are the rules of ranting we will be instituting during the conference and what we expect of ranters and attendees. We welcome your feedback . If you or your organisation is interested in supporting this conference with some sponsorship we have added some information on the opportunities we have available. We’re working on our Code of Conduct - which is challenging! We’re getting a lot of suggestions in under the hashtag #FFSTechConf. If you see a session you’d want to attend, give it a like. What started out as a jokey early morning tweet exchange rapidly turned into something real. We’re going to do a one-day single-track conference, probably in London, probably in late September, details TBC. FFS represents our frustration with some of the unnecessary complexity and wilful stupidity in software delivery, sometimes imposed on us, often self-inflicted. Sessions at FFS will all have a title beginning with “FFS …” and will consist of a 10-15 minute rant followed by 10-15 minutes for discussion. This isn’t just catharsis (although we hope it will be cathartic), it’s a chance to get to the heart of a matter with people who care and have something to contribute.